The major events of 1970 year saw the final unravelling of the US's involvement in Vietnam, as public opinion fell further. The slaying of unarmed villagers known as the My Lai massacre was made public knowledge in November 1969, and charges were brought in March 1970. The war would spill over into Cambodia and then later see withdrawal of US troops, though the war would drag on until 1975. Whereas before Stan had used metaphor, in 1970 he gives a very on-the-nose exploration of the political instability of the time. It perhaps lacks subtlety - Ben can't even fly his part of the Fantasticar without commenting on pollution - but this sense of literalism sees the Fantastic Four placed in charge of a United Nations Meeting and also taking orders from Richard Nixon. With Magneto and the Sub-Mariner teaming up to wage war on mankind, we get Reed calling up the war room, and speaking to someone looking like the then Secretary of Defense Melvin Laird. Asked to be patched through to the President, we get another of Ben's unknowingly prescient remarks regarding Spiro Agnew, as he scorns the luck the FF have been having, and assumes that Nixon will be out to lunch and Agnew will answer. In 1962 Namor could declare war on mankind and Ben was at liberty to strap a nuclear warhead to his back and sort the situation out. Fastforward eight years and he requires the permisson of the President, even if the dialogue does veer only just short of send up on Nixon. 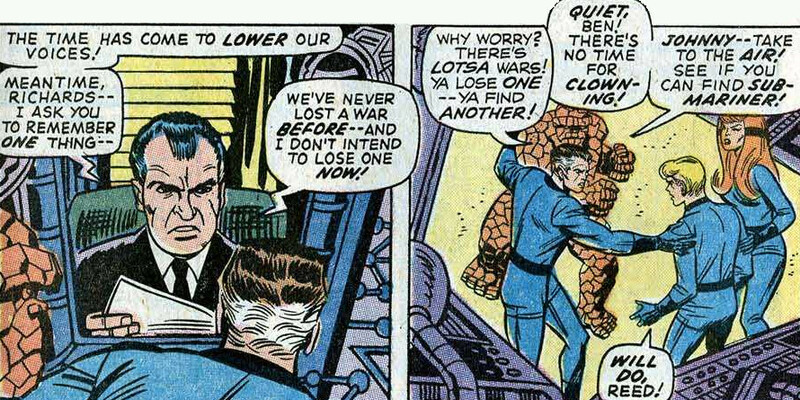 With Nixon using "lower our voices" as a catchphrase and seemingly under the control of his (unseen) wife, it could be argued that Stan was satirising the President, particularly as Reed Richards (Stan’s mouthpiece) is the only one between Nixon and all-out war. There's perhaps never been a more political comment in the title than Ben advising Tricky Dicky to "find another" war to get involved in. Another adventure sees them up against the Monocle, a man obsessed with disrupting a United Nations conference and escalating political tensions. The idea of attacking a political conference wasn't that far-fetched, either... in March 1970 the radical group the Weathermen attempted to explode a bomb at a military dance, while the same month saw The Nuclear Non-Proliferation Treaty go into effect. However, many of these news articles were coincidental, as the comic was of course coming out earlier than the cover dates, and being produced earlier than that. As a rough guide to a form of timescale, then the September 1970 issue features a Soapbox from Stan which he claims to be writing in March. Perhaps fittimgly, when Issue #98 presents one of the few times the Fantastic Four have been tied into a particular time frame, it's a historical work, based ten months before the cover date. 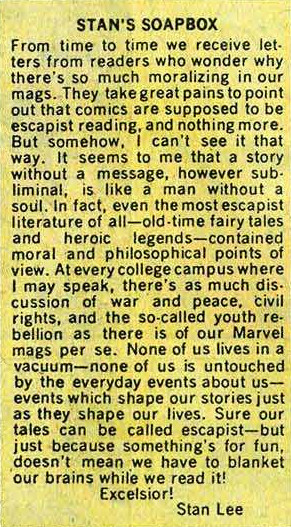 The general guideline for Marvel titles is that the heroes live in a different time from the readers, and that a year of reading doesn’t equal a year of living for them, an easy get-out so that they can avoid retirement. Yet while contemporaneous references abound to key it into the current readership’s accepted lifestyle (Nixon's cameos in #103 and #104, and Sue spends #105 wearing flares) #98 specifically identifies the setting as "The Time: July 1969". However, while a piece of trivia about the chronological development of the series, it’s also vastly more important in terms of where the comicbook could go. The story in question is tied into the real-life NASA moon landing, with a belated return of the Kree to watch over it. The concept of man conquering space was an act that troubled all of science fiction. For The Fantastic Four, they’d gone from populist visionaries of the future, to backward-gazing fads enslaved by the passing of reality. How could Reed, Ben and company still thrill us with journeys to outer space when mankind had done the same thing? It wasn't a question Jack Kirby would ever answer, as he took his cosmic imagination to DC and left Marvel during the year. While he would briefly return from 1976-1978, he had reportedly become jaded with the lack of reward Marvel was giving to his involvement. Stan Lee's 2002 "bio-autography", while glossing over much controversy, alleges that the unresponsive Kirby was offered the lucrative role of Art Director by him but turned it down. Born Jacob Kurtzberg in 1917, Kirby's first cartoonist job actually dates back to 41 years before the FF were even thought of, and it was Jack who co-created characters like Captain America. Much credit is given to Jack for devising the way comics should work in the pioneering days of the comic book, formulating a storytelling style that eclipsed any other. Looking at some of his pre-FF work for companies like Harvey, Atlas, Prize, Timely and National, his work is actually less stylised and more accessible, but even though his first attempt at, say, The Thing, looks a little primitive today, he was devising techniques that others would come to follow as a template. It’s this level of groundbreaking innovation that had already earned him the nickname Jack "King" Kirby long before he worked on The Fantastic Four. It's tempting to assume that Kirby would deliver below-par art on leaving the title, but his last nine issues are, if not among his most memorable, in possession of some of his greatest art. The first issue of the year sees the return of the Frightful Four, and it's an off-beat, comedic tale that evokes the old "haunted house" movies of the 1930s, with Joe Sinnott's superb inks capturing darkness as well as detail, and the colourist lending a real macabre air to events. This was the first time the Frightful Four became nearer to figures of fun and light ridicule, and it's never made quite clear why Medusa joined them in the first place, way back in 1965. She returns here, but as traitor to the Wizard's team, and the group are finally defeated by Agatha Harkness, a resident witch. Hired by Reed and Sue as the newly-named Franklin's nanny, it's as if the two new parents decided having a witch looking after their child was at least a more sensible option than repeatedly leaving him with the blind Alicia. However, it wasn't all top rate work. While the sarcastic lines that Ben says to The Thinker are very amusing, the story of his "evil robot doubles" in #96 are pure pulp, while a homage to The Creature From The Black Lagoon the following issue isn't much better. What's particularly problematical is two great plot holes in both - Reed talks to himself like an android for no reason whatsoever other than to fool the readers, while the marine creature has communication problems as it can't speak... despite the fact that an earlier page sees it talking advanced English to itself. Possibly the most disappointing issue is the 100th anniversary. What should have been an unforgettable occasion is given over to a regular-length story where the Puppet Master and The Thinker recreate androids of most of the FF’s foes in a plotless slug-fest. #101 possesses a striking cover, a wonderfully macabre depiction of the FF being placed into makeshift coffins. Sadly the story itself is a rather generic battle with the Maggia, a crime syndicate that first appeared in Avengers #13. Named as an allusion to some real-life organisation (what was their name again?) this subtle metaphor even sees them dump the FF in a river, though concrete boots are nowhere in sight. Then #102 marked the end of Jack's run on the title. John Romita supplied the cover and took over the pencilling from the following issue, as Stan's Soapbox reminds readers of Steve Ditko and observes "Jack Kirby has unexpectedly announced his resignation from our surprised but stalwart little staff"... just two issues after another Soapbox column saw them both pledge to "continue unabated their efforts". Frank Giacoia inked #96 and #97, while a 29-year-old John Verpoorten inked issues #103-#105. Verpoorten went on to become Marvel's Production Manager, but died in December 1977, aged just 37. 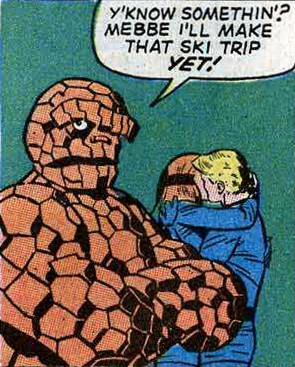 The reason for Joe Sinnott missing such an unusually high amount of issues has never been revealed, so it can be assumed he was possibly taking a vacation. Joe gave an interview to the site, where he spoke of only working on a couple of Romita issues, and suggested that he didn't work with him more just due to John leaving quickly in 1971: "I think that Romita was just too busy doing other things - but I loved working with him. He's one of the best." Trivia, and after so many issues where the FF even wear their costumes to dinner, we finally get a more realistic depiction of the group's downtime, with them wearing civilian clothes in all but four of the issues present. Also look out for the ending to #99, which appears to show Ben completely break the fourth wall in addressing the readers. Then there's Issue #101, where Johnny refers to the boxer Cassius Clay, despite him having changed his name to Muhammad Ali in 1964. It's clear Johnny never saw the Ernie Terrell bout. (When this story was edited into a reprint in 1977 for Issue #180, the dialogue was notably changed to "Ali"). Lastly, from Issue #100 the title resorted to using half-page ads on a couple of pages each issue, meaning that although the stories were still 20-pagers, and once again contained more panels, they were effectively 19 pages of art. This was a practise that continued until 1971's Issue #113, seemingly as a cost-cutting exercise. It’s certainly not a necessity, but #94 refers to events in The Incredible Hulk #113-#114 (****), where the Sandman was turned to glass. The unlikely scenario is that the Sandman is tricking the Hulk into stealing a rocketship for him so he can enter the Negative Zone and track down Blastarr to resume their partnership and take revenge against the FF. Together with the Mandarin he eventually ends up fighting the Hulk, and is thrown into a boiling vat by the Mandarin as the price of his failure. In a moment that would be echoed by the Wizard elevating Hydro-Man’s power for a later line-up of the Frightful Four (FF #514), it’s the Wizard who has restored the Sandman’s abilities in unseen events. Also of note is that Magneto’s appearance in the title is directly tied in to his own come-uppance in X-Men #63 (***).